If you enjoy books that challenge notions of love, loyalty and truth, and then make you grapple with how to harmonize them, this series is for you! SUMMARY FROM BACK: In a society steeped in tradition, Princess Lia’s life follows a preordained course. As First Daughter, she is expected to have the revered gift of sight–but she doesn’t–and she knows her parents are perpetrating a sham when they arrange her marriage to secure an alliance with a neighboring kingdom–to a prince she has never met. If you’re a hopeless romantic like me who believes one should marry for love and not obligation, this book is definitely for you! Bless her heart, Lia is a princess born into a life of obligation. Rather than settle for the life laid out for her, on her wedding day she disobeys tradition for the sake of finding true love. She disguises herself and becomes a barmaid for a tavern in a town far away from her responsibilities. Hoping never to be found out, two strangers arrive in the tavern and she waits on both. Little does she know they have both sought her out for reasons of their own. One is the crown prince of the neighboring kingdom she unknowingly was to be wed to. The other is a paid assassin come to eliminate her by a warring kingdom. Needless to say, she falls for both of them forming a love triangle, for neither admit who they truly are. This was a fun read because it kept me guessing the whole time, trying to figure out which character was the assassin and which, the prince. The plot was different than so many for it twisted and turned in unexpected, but engaging and believable ways. Well done! NOTE: If you plan to read this book and you don’t want spoilers, DO NOT continue reading this review for it will give away much of what makes book one so special. SUMMARY FROM BACK: Held captive in the barbarian kingdom of Venda, Lia and Rafe have little chance of escape . . . and even less of being together. Desperate to save her life, Lia’s erstwhile assassin, Kaden, has told the Vendan Komisar that she has a magical gift, and the Komisar’s interest in Lia is greater than either Kaden or Lia foresaw. Meanwhile, the foundations of Lia’s deeply-held beliefs are crumbling beneath her. 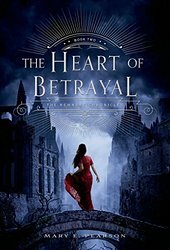 Nothing is straightforward: there’s Rafe, who lied to her, but has sacrificed his freedom to protect her; Kaden, who meant to assassinate her but has now saved her life; and the Vendans, whom she always believed to be barbarians but whom she now realizes are people who have been terribly brutalized by the kingdoms of Dalbreck and Morrighan. Wrestling with her upbringing, her gift, and her very sense of self, Lia will have to make powerful choices that affect her country, her people . . . and her own destiny. In book two, we see Rafe and Lia’s love deepen as they share in their imprisonment by the Vendans. They have a lot of time to think about their situations and each other. Rafe’s character is deepened considerably in this book and through it we see how much he really loves Lia to the point of sacrificing himself for her. The author did a great job of world building as the imagery comes to life in a way that brings to story along. I love how Lia is forced to confront long held, but unexamined beliefs about another culture. She had been taught the Vendans were nothing but low-lifes and assassins, but as she spends time in their prison, she discovers all she believes may not be true. I love how the author plants the idea of examining areas of our own lives, unexamined beliefs that may or may not help us produce the future we seek. I also enjoyed Pearson’s treatment of Kaden who must find his way between his love for Lia and his loyalty for the Komizar, his boss. It’s an issue we must all face at some point in our lives and the struggle that played out did this conflict justice. My Review: 5 Stars to both book one and two! I’m glad you found my reviews helpful 🙂 I think you’d love these as much as I did. Love can certainly get complex! The books sounds interesting, but then I am a hopeless romantic. Congrats on the review. LOL! I, too, am a sucker for a good romance… And you’ll definitely find more than one in this series 🙂 Enjoy!